A memory upgrade is usually a good, cheap and easy way of increasing overall computer performance, and upgrading netbook memory is often one of the easiest computer upgrades. 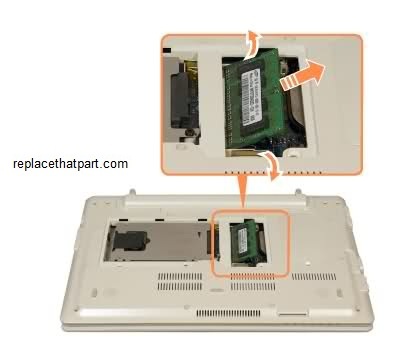 Do you want to get a little more power out of your Toshiba NB205 or NB200 Netbook? Upgrade that 1GB memory module with a 2GB SODIMM. It will speed up opening new applications, running multiple applications at once, and switching between software applications (multi-tasking). Here’s a complete and easy guide on how to upgrade your Toshiba’s NB205 or NB 200’s memory. Purchase the right memory. For your Toshiba NB205 or NB200 you need a standard 200 pin DDR2 SODIMM laptop memory module (not desktop memory). Toshiba recommends a 2GB DDR2 SODIMM memory module of 533MHz or 667MHz. These may be referenced as PC2-4200 or PC2-5300. The PC2-5300 667MHz SODIMM is the most popular netbook memory upgrade and a faster module is backwards compatible, so a 667MHz SODIM will definitely work. Recommended brands include, but are not limited to, Crucial, Corsair, Kingston, Patriot, and Viking. A memory module is installed in the memory slot at the bottom of your computer. There is, however, only one memory slot on the motherboard so this means that you’ll have to remove the current RAM module in order to insert a new one. The procedure to replace the memory is described below. 2. Power off your NB205/NB200 if it’s on. Also, unplug the AC power adapter. 7. The solid-state drive and memory are secured in a dedicated compartment. 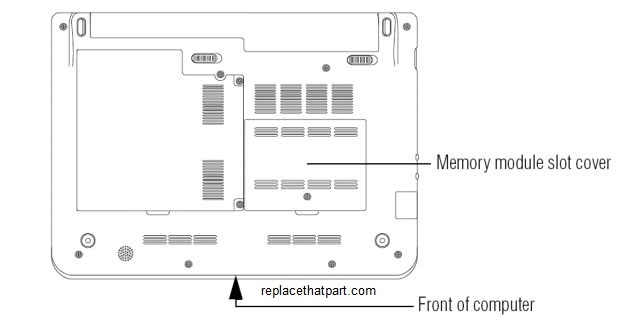 Remove the Memory compartment cover. a. 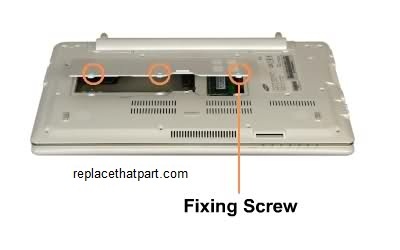 Use a small Precision Screwdriver Set for Laptops and Electronics to remove the screw that secures the compartment cover. 8. Press outwards on the latches on both edges of the socket at the same time, remove the SODIMM; The memory module pops up slightly. Gently lift the memory module to a 30-degree angle and slide it out of the slot. Be sure to save the old SODIMM for future use. 10. Turn the module so the teeth are facing the SODIMM slot and the sticker is face down. It’s impossible to put the memory module in backwards thanks to the notches which “key” it with the slot. Position the module toward the socket, aligning the connector’s notch with the matching key in the socket. This is important; you want to stick in the new memory module at a 30 degree angle. Firmly press the memory module into the memory slot’s socket. The module should be seated so that you don’t see any of the gold contacts. 11. Once the module’s connector is fully inserted into the socket, press downward on the top edge of the module to seat the module into the latches at the sides of the socket. These latches should “snap” into place securely with the corresponding cutouts in the side of the module. Make sure that it is firmly fixed in the slot and does not move easily. If the memory does not fit easily or if the latches and cutouts do not line up correctly, repeat step 8 and 10, take it out and try again. 12. Before you close your case, replace the battery. When the battery pack is inserted, it will automatically lock. 13. Turn your computer back on. The BIOS automatically detects the amount of memory in the system and configures CMOS accordingly during the Power-On Self-Test (POST) process. There is no hardware or software (including BIOS) setup required after the memory is installed. You should see the new amount of memory displayed on your startup screens or in the properties for “My Computer”. Right click on the “My computer” icon and select “properties”. 16. Close the Hard Disk Drive/Memory compartment cover. 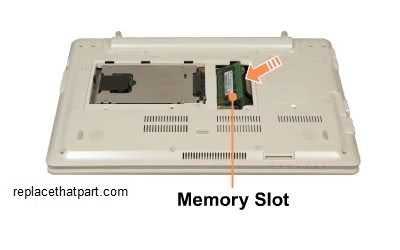 A memory upgrade is usually a good, cheap and easy way of increasing overall computer performance, and upgrading netbook memory is often one of the easiest computer upgrades. 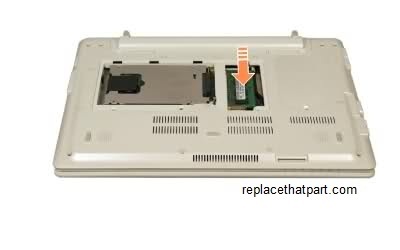 Do you want to get a little more power out of your Toshiba NB255 and NB250 Netbook? Upgrade that 1GB memory module with a 2GB SODIMM. It will speed up opening new applications, running multiple applications at once, and switching between software applications (multi-tasking). Here’s a complete and easy guide on how to upgrade your Toshiba NB255 and NB250’s memory. Note: From time to time, Windows will display a pop-up that says, “Do you want to allow the following program to make changes to this computer?” This is a security feature to prevent programs or people from doing things on your computer without your permission. If you were trying to perform the action, click Continue; otherwise, click Cancel. If unsure, cancel and try again. 2. Power off your NB255 and NB250 if it’s on. Also, unplug the AC power adapter. 6. Be sure to ground yourself. Touch a piece of grounded metal (like a tap) or a large piece of metal for a couple of seconds and you should be fine. 7. The memory is secured in a dedicated compartment. Remove the Memory compartment cover. a. 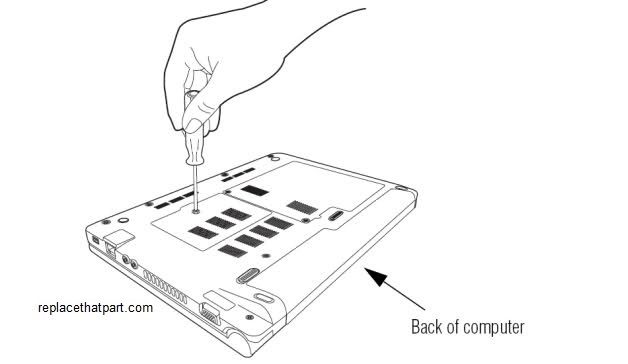 Use a Precision Screwdriver Set for Laptops and Electronics to remove the screw that secures the compartment cover. 10. Turn the module so the teeth are facing the SODIMM slot. It’s impossible to put the memory module in backwards thanks to the notches which “key” it with the slot. Position the module toward the socket, aligning the connector’s notch with the matching key in the socket. This is important; you want to stick in the new memory module at a 30 degree angle. Firmly press the memory module into the memory slot’s socket. The module should be seated so that you don’t see any of the gold contacts. 13. Turn your computer back on. The BIOS automatically detects the amount of memory in the system and configures CMOS accordingly during the Power-On Self-Test (POST) process. There is no hardware or software (including BIOS) setup required after the memory is installed. You should see the new amount of memory displayed on your startup screens or in the properties for “My Computer”. Right click on the “My computer” icon and select “properties”. ”. The screen which appears should show approximately 2GB of RAM (usually 1.99GB). The memory capacity reported in Windows might be less than the actual capacity of memory. This is because BIOS or the onboard graphics uses a portion of memory or claims it for further use. Do you want to get a little more out of your Samsung NC20? Upgrade that 1GB memory module with a 2GB module. Here’s a complete and easy guide on how to upgrade the memory inside your NC20. Purchase the right memory. For your Samsung NC20 you need a standard 200 pin DDR2 SODIMM laptop memory module (not desktop memory). Select a 2GB DDR2 SODIMM memory module of 667MHz (or 533MHz). These may be referenced as PC-5300 (or PC-4200). Recommended brands include, but are not limited to, Crucial, Corsair, Kingston, Patriot, and Viking. A memory module is installed in the memory slot at the bottom of your computer. The procedure to replace the memory is described below. 2. Power off your NC20 if it’s on. Also, unplug the AC power adapter. 3. Prepare your NC20 by placing it upside-down on a flat surface with some form of soft padding. Static electricity can damage your module and other computer parts. Make sure that you are working in a static-safe environment. Remove any plastic bags or papers from your work space. 4. Remove the battery. This will prevent you from accidentally shorting anything on the system board during this process. 6. Be sure to ground yourself. Touch something metal for a couple of seconds and you should be fine. 7. 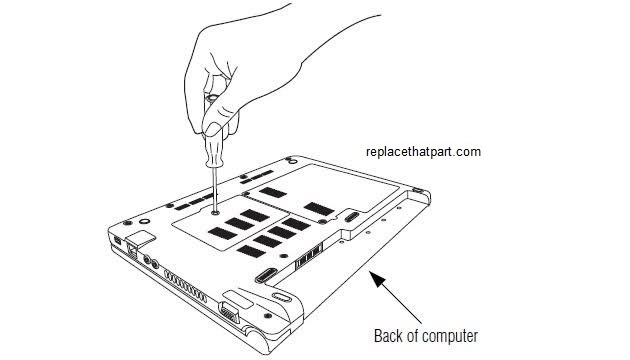 Remove the 3 screws on the memory/HDD compartment cover at the bottom of the computer using a Precision Screwdriver Set for Laptops and Electronics . 8. 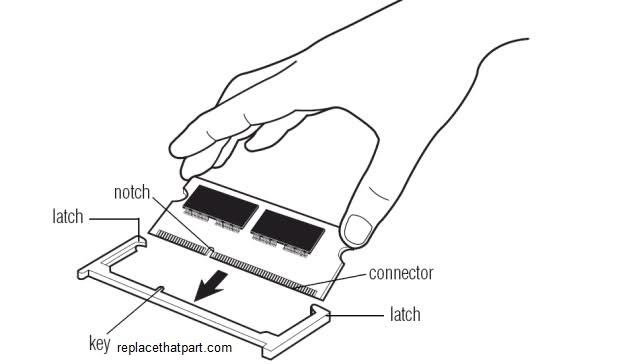 Pull the memory module latches outward. The memory will pop up. Remove the memory module out at an angle of 30 degrees. 10. Insert a new memory module into the memory slot at an angle of approximately 30 degrees aligning it to the angle of the memory slot. 11. Push the memory module down so that it’s completely fixed. If the memory does not fit easily, push the memory module down while puling the memory module latches outward. 12. Test it. Before you close your case, turn your computer back on. You should see the new amount of memory displayed on your startup screens or in the properties for “My Computer”. If everything works correctly, you are done and you can close your case. If you have any problems, go to step 13 for troubleshooting tips. 13. Troubleshooting. If you have trouble with your new RAM, check these things first. Check the power cords. Is everything plugged in properly? Check the module. Did both side clips snap to hold the module firmly in place? Try removing the module and replacing it to make sure it is seated properly in the slot. If you’re still having difficulties with your RAM, check the Crucial FAQ section. You may find an easy solution for your problem. 12. 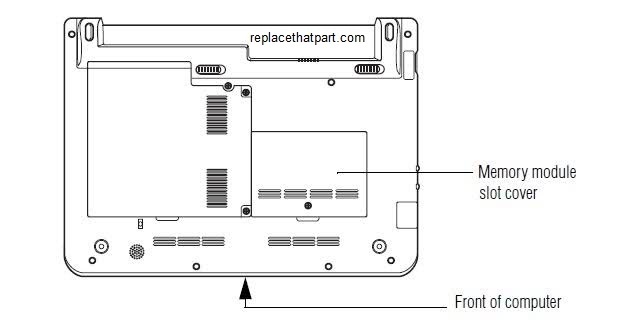 Close the memory/HDD compartment cover and fasten the screws.